I made a level for the popular Knytt Stories game. The game play focuses on avoiding enemies and Metroidvania style exploration through the collection of power-ups and keys. ~ I made a level for the popular Knytt Stories game. 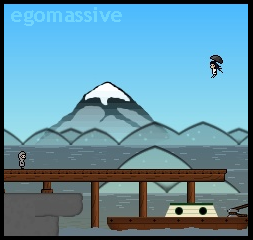 KS is a platformer which seemed to be designed around the concept of user created levels. The game play focuses on avoiding enemies and Metroidvania style exploration through the collection of power-ups and keys. 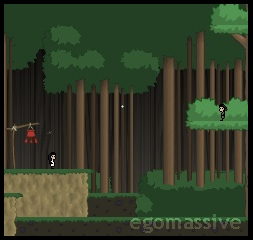 In this scene I tried to create a dense forest combining a standard tileset with my own. Here you can see my mountain vista which slowly tracks across the distance as Juni, gliding through the air here, moves across the world. This is in a spooky village in my level. ~ What drew me to Knytt Stories initially was the high quality of game play in the original levels. Then, the official third-party pack continued to impress. Finally, I decided to build my own level. That’s when I discovered the Knytt Community. The community surrounding Knytt Stories is quite large and full of people with diverse talents. In the end, this level I made is not simply a fun pastime for me (and you), but an introduction to a world of creative minds. Together we could build better games than we can individually. Knytt Stories is a catalyst towards that end. ~ This level is called “A Knytt in Time”. It’s a play on the saying, “A stitch in time saves nine.” The concept behind this level is 1 part homage and 1 part boundary pushing. The game universe is set up as legends about a girl named Juni. I wanted my first level to stay within that concept and other themes that reoccur in many KS levels. So, my story involves Juni, a destructive machine, an environmental duality, and teleportation. There are also nods to other levels which are either popular in the community or well liked by me. In the boundary pushing corner, I wanted to do some things I hadn’t seen before. The most prevalent of these is a persistent vista in the background. I also wanted to raise the bar on design complexity without hampering the playability. ~ Anyway, You can get Knytt Stories here. and you can get A Knytt in Time here. 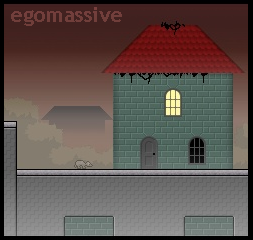 ~ March 19, 2010: I have now created an easy version of this popular level. LoCP stands for League of Crap Players. After reading their discussions of this level, I decided to make a version that matched their platforming skills. I recommend that anyone who does not consider themselves a “crap player” should play the original. There is no bonus content or anything like that.